Elysee Miami condominiums is an ultra-luxury preconstruction development located at 700 Northeast 23 Street in the neighborhood of Edgewater. 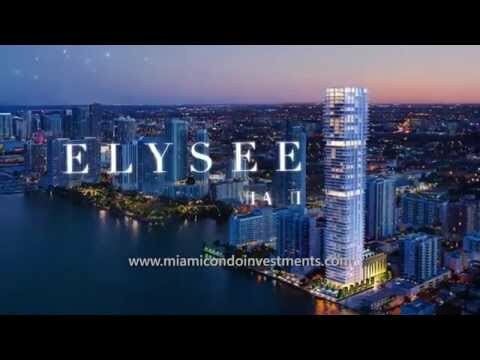 Elysee Miami condos will rise 57 stories and be comprised of just 100 residences consisting of 3 to 5 bedroom units ranging from 2,660 to 3,995 interior square feet with 10- and 11-foot ceilings. Elysee Edgewater, developed by Two Roads Development with building design by Arquitectonica and interior design by Jean-Louise Deniot, offers a breathtaking waterfront location. Once completed, Elysee is sure to be one of Miami’s finest condo developments. Amenities of Elysee condominiums leave nothing to be desired. They include an outdoor summer kitchen & BBQ terrace, fitness center,gym, Yoga studio, spa with sauna,steam shower & private massage rooms, and a children’s room adjacent to the fitness center. On the 30th floor amenity deck there is a grand piano, unobstructed views of Biscayne Bay and Downtown Miami, private dining room, library/private theatre,chef’s kitchen, wine storage, and game room. Elysee condos, located in the hip neighborhood of Edgewater, is convenient to the Design District, Brickell, Wynwood, Downtown Miami, Miami Beach, and the Arts and Entertainment District’s nightlife. The Port of Miami and Miami International Airport are a short drive from the Edgewater neighborhood.